Terracotta, taken from Latin terra cotta or baked earth, is the art of creating glazed or unglazed porous earthenware, figurines, and other decorative materials from clay which is dried and fired in temperatures of around 1000°C giving it a distinctly orange, red, brown, yellow, or grey color. It is then covered in sand to allow it to cool down. This color depends not only on the type of clay found in the beds of the water bodies in the area where the artist is based but also on the firing process. For example, if the smoke from firing is allowed to get out through the vents in the kiln, a red or orange color is obtained. On the other hand, if the vents are sealed, it gives the items a black color. Decorative pieces are either left with their original color or painted in multiple hues to make them more attractive. Terracotta items, when not cracked, give a ring when struck lightly with fingers. Terracotta is an ancient art form, perhaps one of the first expressions of creativity of human mind. In fact, the use of the five elements: air, water, earth, fire, and ether in Terracotta art form lend it both an air of mystery and auspiciousness as per Hindu beliefs. Terracotta figurines of mother goddess, male gods, and terracotta cart frames and wheels dating back to around 7000 BC have been excavated from various sites of Indus Valley Civilization like Birhana, Mehrgarh, Mohenjodaro, etc. proving that the art flourished in the Indian subcontinent long before it was used elsewhere. Terracotta also had an important role to play in the trade activities of this ancient civilization. Terracotta seals were used by merchants for stamping and human or animal figures carved on them. These seals also depict the apparels, hair styles, ornaments, as well religious beliefs of the people, apart from giving an idea of the script used by them. In the rest of the world too, terracotta art has been in existence since thousands of years. In Egypt, Terracotta house models dating back to around 1900 BC have been excavated. These models were part of the burials of poor people and usually were replicas of their dwellings. Mesopotamian civilization was also rich in arts and crafts and beautiful terracotta figurines of goddesses and small statues from around 19th century BC have been found by the archaeologists. Bell Idols or female statuettes having mobile legs from 8th century BC Greece is a noteworthy example of Terracotta art in ancient world. These bell idols were popular in Both Greece and Rome. Another terracotta wonder from the ancient world is the Terracotta Army of China from 210 BC, part of an ancient necropolis, and built by the emperor Qin Shi Huang. The King's terracotta army consists of 6000 life-size terracotta soldiers guarding his tomb. The army is complete with soldiers, archers, horses, and chariots. What's amazing about these soldiers is that each of them has been made having different facial features. The ancients used the pressure of their hands to painstakingly give shape to each terracotta item but with increase in the type of uses and demand, moulds were made to start mass production. One of the first examples of mass produced terracotta figurines is that of ancient Greeks' Tanagra figurines from later 4th Century BC. West Bengal has a rich tradition of art and craft and terracotta is one of them. In fact, rural areas of the state are a treasure trove of finely crafted terracotta pots, figurines including those of handsome horses and other items, small and large, practical as well as decorative. Some of the well known towns for Terracotta art form are Murshidabad, Jessore, Birbhaum, Digha, and Hooghly. The art form came to this state in the 16th century with the influence of Vaishnavite movement which found expression in Terracotta sculpting on Krishna temples built by them. People of West Bengal also worship the snake goddess Manasa by creating a shrine constructed with tree branches, terracotta snakes and pots. Terracotta artisans of West Bengal use a mix of two or more types of clay taken from river beds and pits and their patterns are usually traditional or community-related. The fuel used for firing is firewood, dry leaves, and twigs which are available locally. The molded items are baked in traditional kilns at temperatures of 700°-800°C. Both men and women participate in the process with the women responsible for working the wheel and giving the upper part of the pots or the necks a round shape. Other items like dolls, figures, jewelry, wind chimes, and toys are cast in burnt clay moulds. Terracotta art in Bihar goes back to the Mauryan period (2nd-3rd cebtury BCE). Horses are a recurrent theme in Indian terracotta across states and Bihar is no exception. Darbhanga in Bihar is well known for its terracotta horses that are painted in bright rainbow colors on completion. Other items include clay elephants that are placed on roof tops to signify marriage in the house. Terracotta artisans from Gujarat, especially from Gundiyali in Bhuj district, use the potter's wheel to create exquisite hand-painted clay pots with geometrical patterns almost identical to the ones excavated from the sites of Indus Valley civilization. Other terracotta items popular in the state include the votive figures of animals like horses, cow, elephants, tigers, bulls, buffalos, and even insects which are placed in shrines by devotees. The state is also well-known for Dhabus, dome-shaped abodes for the spirits of the departed. This central Indian state has a rich tradition of creating terracotta figures for rituals as well as for day to day uses. Life-like figurines of Hindu deities, human forms, birds, horses, snakes and huge elephants are some of the more popular ones created by the artists. Tamil Nadu, the temple state of India and one steeped in thousands of years of history and rich cultural heritage is known for making large terracotta horses. In fact, villages of the state follow a tradition of having a huge terracotta horse figure guarding its entrance. This horse is a companion of Aiyyanar, the Tamil Village God. His colorful statues are also flanked by large white horses and elephants or the lord is depicted riding on them. These statues are prepared by mixing sand and straw to clay to get a certain consistency and wood pieces covered in clay are used for legs. The rest of the ceramic pieces including the head and the accessories are separately created and joined on an auspicious day and fired in a straw and cow dung kiln covered with mud. Nowadays moulds have come to be used for creating these horses given their popularity. Apart from Aiyyanar and his companions, shrines of other village gods and goddesses are also represented by terracotta statues. These include the Naga or Serpent shrine, Ganesha idols, etc. Apart from religious figurines, daily use items like water pots, cooking pots, grain storage containers, etc. 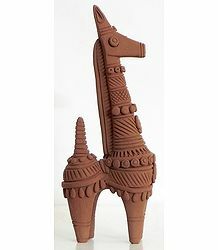 are also made using Terracotta. As per legends, the potters of Tamilnadu, also known as kuyavar or velar, trace their origin to the heavenly master craftsman Vishwakarma. This state has a tradition of clay and terracotta art dating back millennia to Pre Harappan and Harappan culture. People used the skill to create a wide range of items including toys, figurines, jewelry, toy cart frames, etc. Around 1000 B.C., painted grey ware (PGW) with black designs began to be made as is evident from excavations at the various sites around the state including Kurukshetra. These are usually associated with the Mahabharata period. Sugh in Haryana is another important Terracotta center with figurines of mother goddess, animal and bird figurines and Yaksha statues having been found at many sites. Today, the terracotta artists from the state create products such as two toned or colorfully painted vases, pots, lamps, toys, human and animal figurines, wall hangings, and musical instruments among others. 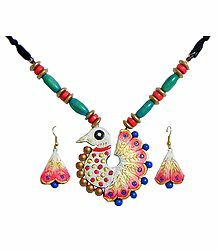 Beautiful terracotta jewelry including neck and ear pieces is a specialty of the state. Like Haryana, Rajasthan also has an age old tradition of terracotta art and the state is well known for its various distinctive terracotta articles. The arid state also has a special connection with clay and terracotta as people in villages carry water from distant sources to their homes in terracotta pots. Moreover, their daily worship is connected to terracotta idols of deities. 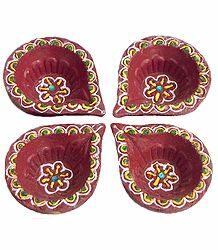 Alwar in Rajasthan is famous for making paper-thin light-weight pottery, also known as Kagzi while Pokharan is known for red and white terracotta articles with incised geometrical patterns. Terracotta horse figures, Ganesha idols, as well as idols of local deities like Nag Dev or the serpent god, Bhairav, and other heroes made in Molela are popular in the state. Bikaner district is famous for colorful pottery items painted with lac colors. 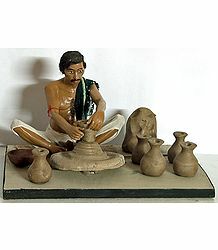 Terracotta toys and animal figurines are sold in village haats or markets as well as in fairs. The art of making these toys is a legacy from the ancient Kalibangan site of Indus Valley civilization in Rajasthan. The clay used by artists comes from local ponds. 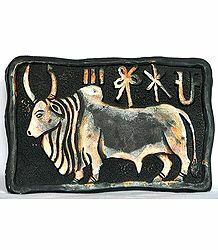 Coarse clay is used for plaques and mixed with donkey dung collected by women folk in the proportion of 1:3 making the clay suitable for molding. This northern Indian hilly state has terracotta artists that have their origins in Rajasthan, Punjab and Kashmir. Most of the terracotta artists here are settled in towns of Kangra, Chamba, Mandi, Kulu, and the state capital Shimla. Tracing their lineage to Lord Vishwakarma, these artists are well known for their red and black pottery which is etched with circular or linear patterns before firing and painted black and white. Terracotta art in Odisha goes back to 4th century BC and the tribal artisans create unique designs using special clay which has many takers both within the country and abroad. Animal figurines of bulls, horses and elephants are exquisitely molded and highlighted and left in their original clay color. Others household items like jars, tea cups, plates, roof tiles, pots, toys, pots, candle stands, etc. are also made with the unique tribal touch. Jewelry like bangles and necklace sets are also popular items. The tools used by the artists include the potter's wheel, a wooden stick to rotate the wheel, a hollow cylindrical tube, a hammer, and a wooden slab to beat the clay. The clay is mixed with ash and sand before being molded in desired shapes. In this northern most state, terracotta art has two distinctive forms. While one, made in Ladakh, consists of icons, statues, and images related to Buddhism and made mainly to cater to the various monasteries, the other consists of tea kettles, barley wine pots, kitchen stoves, oil lamps, etc. These items are finely molded and brightly colored and used for practical purposes as well as home decor. The kettles especially are beautifully crafted with its spout, handle, lid as well as brazier. Tools used for creating them are simple, made of leather, stone, and wood. Another unique item is clay mask which is made using cloth, waste paper, flour, and glue. Use of terracotta to supplement brick and tiles buildings became quite popular in late 1800s England and the US. The Victorian Bell Edison Telephone building is a fine example of terracotta architecture in Birmingham, England. The Natural History Museum in London also has a huge and highly ornate terracotta façade. Before this, it was also used in Germany in 1820s in the construction of churches. However, in India, the trend of using cheap and readily available clay for building temples started a few centuries earlier. The 6th century Bhitargaon (Uttar Pradesh, India) Hindu temple, built during the reign of Gupta Dynasty, has beautiful terracotta panels that depict Shiva, Vishnu and aquatic monsters. 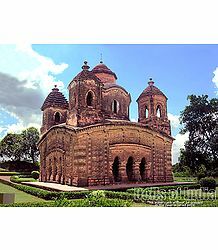 Other, more famous, example of terracotta use in Indian architecture is the terracotta temples in Bishnupur, Bankura (West Bengal). From being used for daily use and home décor items, terracotta came to be used for making temples in 15th - 16th century AD. The popularity of this building material lay in its universal and abundant availability across regions. Once people learned to bake the clay, they had a way of giving permanence to the items created by them. Slowly, terracotta art was put to more ambitious uses of creating accommodation and other buildings sometimes replacing stone or stone and wood carving due to their non-availability. Though there are many temples in West Bengal along the alluvial delta of the river Ganges, terracotta temples of Bishnupura in Bankura district are the most popular due to their exceptional terracotta carving and sculptures. 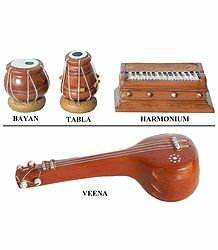 As mentioned before, Vaishnava movement played a great role in influencing terracotta art in the state and the Malla kings of Bishnupura, devout Vaishnavites, invited scores of higher caste Hindu gentry as well as skilled potters, weavers, masons and master craftsmen for constructing the temples to perfection. A scarcity of stone in the region led to the use of bricks for creating the temples which were then covered with ornate terracotta tiles that depict themes taken from Puranas, and the Ramayana and Mahabharata epics apart from those related to everyday life. The temples are a fine example of a marriage between traditional arts based on the Shilpa Shastras and the imagination and expertise of the artists of the time. Terracotta art is not just popular in India and the world from a consumer point of view; rather it is fast coming to homes as a hobby that boosts creativity, patience and focus. 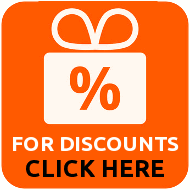 Today, there are many institutes that teach pottery and terracotta home décor items to people from all age groups. Portable kits for creating clay pots are available for children. Creating beauty with a lump of clay, a wheel, a kiln, and the pressure and dexterity of the artisan's hands is what terracotta art is all about. The artisans, often uneducated and leading a simple life, nonetheless create magic which entices locals and tourists alike. From the humble pot used to store water and keep it cool in summers and the small Diyas or votives to the most elaborately crafted door panels, temple facades, and statues of Gods and Goddesses, a terracotta artisan's vision and creativity knows no bounds. Terracotta art has existed in India for around 10,000 years, the oldest excavations of terracotta items being from Birhana (Haryana) site which is a pre-Harrappan site of Indus Valley Civilization. Tamil villagers have built huge hollow terracotta horses with elaborate embellishments which are probably the world's largest hollow clay figures. The world famous Blue Pottery of Jaipur and the Delhi Blue Pottery uses no clay! 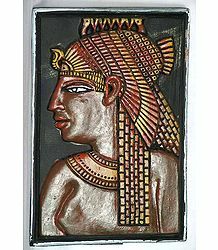 It is made by using an Egyptian paste made of quartz powder, powdered glass, Fuller's Earth (multani mitti), borax, gum, and water.